The upperside view of a female Common Five Ring. 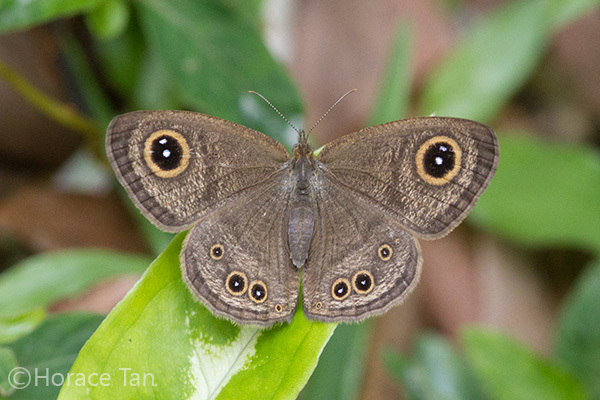 The upperside view of a male Common Five Ring. 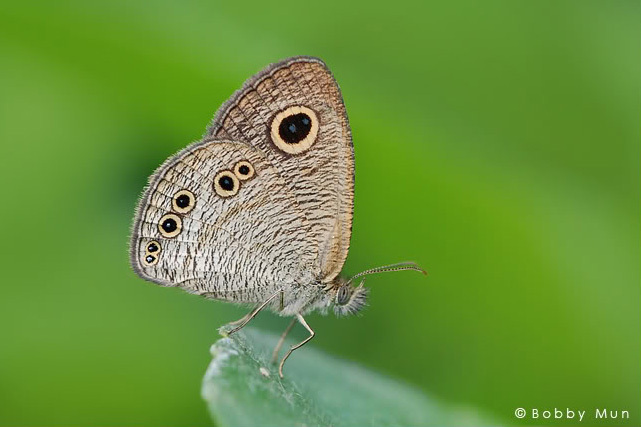 On the upperside, the wings are dull brown with the female being paler in the ground colour in the distal halves of both wings. 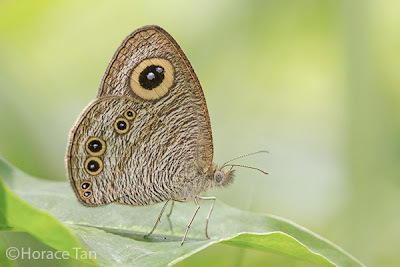 Both sexes have a large yellow-ringed ocellus in space 2 of the forewing, and two smaller and adjoined yellow-ringed ocelli in spaces 2 and 3 of the hindwing (with another ocellus in space 5 in some specimens). 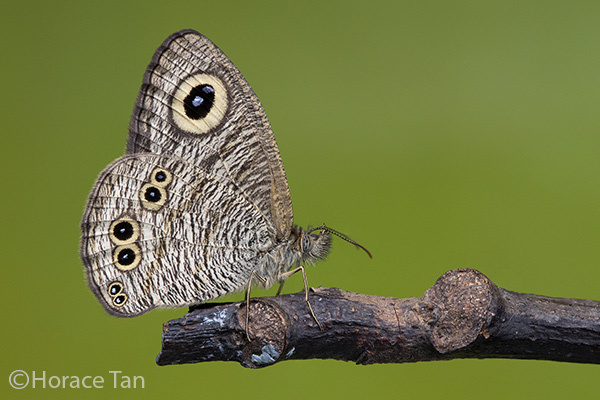 The male has a broad strip of greyish black brand in the forewing. 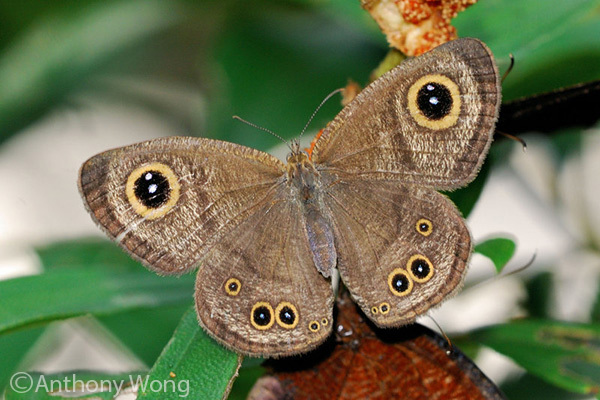 On the underside, both wings are pale greyish to bluff brown against a whitish background, and are traversed by numerous fine dark brown striae. The forewing has a large, bi-pupilled, yellow-ringed subapical ocellus. 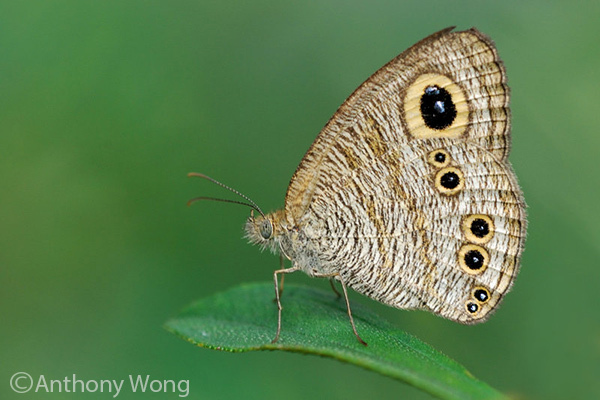 The hindwing has five yellow-ringed ocelli in spaces 1b, 2, 3, 5 and 6. Some specimens might bear another small ocellus in space 4. 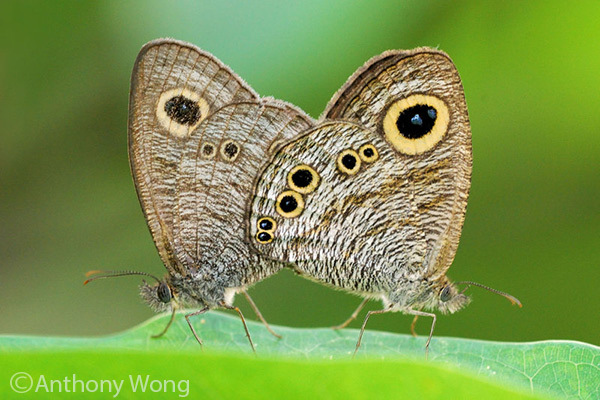 The pair of ocelli in spaces 2 and 3 are large and adjoined, and the one in space 1b consists of two conjoined spots. The pair of ocelli in spaces 5 and 6 are typically adjoined, with the one in space 6 larger than the one in space 5. 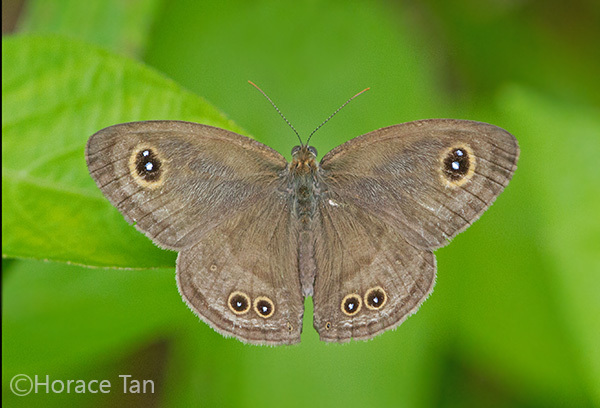 The Common Five Ring is moderately common in Singapore,and are more commonly observed in the Southern Ridges. Adults are typically sighted flying low among vegetation in and around grassy patches. As with other Satyrinae members, the adults fly in an erratic and jerky manner. The adults visits flowers for nectar and sun-bathe with fully opened wings in sunny conditions.